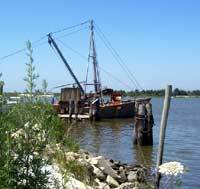 Protection of the natural resources enhances the Bayshore’s vital industries and economy. The billion-dollar businesses of commercial and sport fishing and marinas rely on the sustained bounty from the bay. Farming and commercial food processing industries rely on farmland preservation. Millions of songbirds, raptors and shorebirds find habitat in the Bayshore region each year, creating an internationally renowned bioreserve along the eastern seaboard. Nature tourism provides more than $34 million per year for local economies. Many studies have documented that protection of natural resources protects the economy including the resource book Economic Impact of Protecting Rivers, Trails and Greenway Corridors available through the National Park Service. The New Jersey Audubon Society has documented how wildlife watching can stimulate growth in local businesses.